I was born in the generation when Duran Duran, Menudo, Spandau Ballet, George Michael, Madonna and Michael Jackson dominated the airwaves in the music industry. It was in my generation that non-traditional instruments such as synthesizer and other electronic gadgets were used to enhance the music. It has come a long way and today, electronic music has become more popular. The demands of audio software is not surprising because the music these days uses sound effects and more. It is just amazing what technology can do to enhance the type of music that we have today. If I were to ask you, what music is your preference? For not so tall woman like I am, I brave myself to wearing 5 inches espadrille. It's a bamboo platform woven wedge and let me tell you, it is really comfortable. When I wear this footwear, I look taller especially when I paired it with jeans or Capri. If you hate the pink color, relax! This is not the girly type pink that you imagine. I bought this espadrille footwear in Victoria's Secret and I doubt if they still have it. Just check the website and check out their shoes collection. I ordered my bread maker on the last week of December and after waiting for more than a week, it never came. That's really weird since the other 4 items arrived on time. I called Belk.com and thank goodness, the customer service representative who answered me knows what he is doing. We both tried to track the item using the tracking number and it was lost. He told me, it was lost between the warehouse and the carrier. He automatically place the order for me in the same price with overnight delivery. I got my new bread maker yesterday and boy, this product is just huge and pretty. No wonder that someone will be interested to have it in their kitchen. I was really glad that the customer rep who answered my call was really nice. I hope all the customer service representative are like him. The original price is $134.99 in Belk.com and I got it for 50% off. Today, I am baking a Carrot Cake. 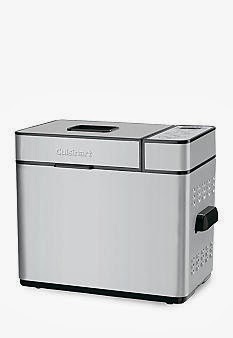 When I am done, I will blog about it in my Food blog and I am hoping that my first attempt of using this Cuisinart Automatic Bread maker will be a success. Good luck for me. Have a great day y'all and bundle up to keep you warm. This Polar Vortex phenomenon is too much right? Have a hot cocoa and stay safe.